This year, I added eggplant to my garden rotation and I am loving all the eggplants I’ve been harvesting, even way into the fall season. 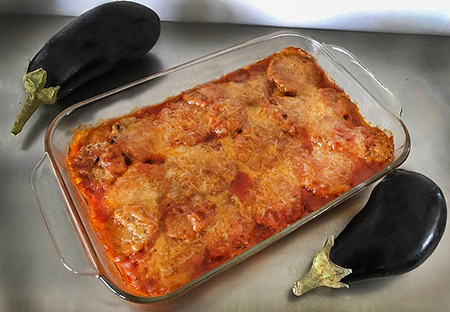 Until writing this blog, I didn’t realize what a nutrition powerhouse eggplants are, containing a lot of antioxidants to protect against diseases and phytonutrients to improve cognitive function. Eggplant is high in fiber, helping keep you full while improving your digestion and overall gastrointestinal health. They are also high in iron, calcium, and potassium making it important in overall bone health. A good source of iron, eating eggplant helps reduce the risk of anemia. A great option for vegetarians and vegans who don’t get iron from consuming animal products. A great meal for Meatless Monday, we eat it with a side with whole wheat or brown rice pasta and a green salad. Wash and slice the eggplant into ¼ inch thick slices. Sprinkle eggplant with salt on one side. Scramble egg in a bowl and place the breadcrumbs on a plate. Bread the eggplant by dipping it first in egg, then breadcrumbs. At this point, you can either brown in an olive oil lined skillet on both sides or for a healthier option, bake in an olive oil greased cookie sheet on 350 degrees, flipping both sides until breadcrumbs brown. In a separate pot, sauté minced garlic cloves for a couple of minutes, then add tomato sauce, basil, salt, and pepper to taste. On a 13×9 baking dish, pour ½ cup sauce to the dish and spread evenly. Then add sliced eggplant, followed by another ½ cup sauce and ½ cup of shredded cheese. Add the final layer of eggplant, ½ cup sauce, and ½ cup cheese. Bake in the oven at 400 degrees covered for 45 minutes. P.S. For a limited time only, give yourself or a loved one the gift of my award-winning book, “Busy Mom’s Cheat Sheet: Raising Happy Healthy Kids”. Learn the tools to lead and teach your kids to have a healthy happy life, including 45 easy, quick, healthy delicious recipes even the pickiest bellies at home will love! Enter discount code VV4APGS4 at checkout.